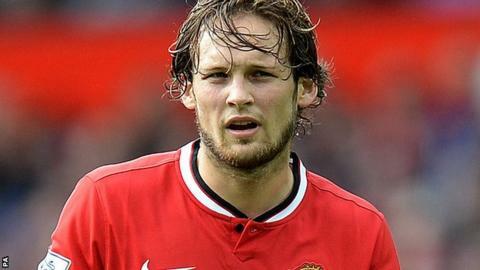 Daley Blind's knee injury will sideline him for several weeks but not six months, say Manchester United. "First he needs to rest for 10 days, then we will have a better idea," said United boss Louis van Gaal. United had initially tweeted that the Dutch midfielder, 24, would be sidelined for six months. "I can't say it will be six to eight weeks," added Van Gaal. "I can't even say it will be 10 to 12 weeks. But it is definitely not six months." United quickly deleted the tweet about Blind, who was injured in his country's 6-0 win over Latvia on Saturday. But the player tweeted a picture of himself wearing the knee brace following the confusion about his injury status. "Wow, all of a sudden a lot of messages!" he wrote. "Still working hard guys, but don't worry; I'll be back stronger! And thanks a lot for all the kind messages!" Winger Angel Di Maria and goalkeeper David De Gea, who were injured while on international duty for Argentina and Spain respectively, are fit to face Arsenal in the Premier League on Saturday. Defender Luke Shaw is doubtful, while fellow England international Michael Carrick is expected to be available. "Di Maria has trained today normally so I don't think that is a question mark, but Shaw is," Van Gaal added. "De Gea is good, no problem. I think with Michael Carrick I have to wait for the reaction in training, but I also expect he's ready to play." Van Gaal also reflected on Wayne Rooney's 100th appearance for England in a Euro 2016 qualifying win over Slovenia. The England captain scored once in the 3-1 victory at Wembley, then followed that up with two goals in the 3-1 win over Scotland in Glasgow. "I have congratulated him but now he has to score for Manchester United," said Van Gaal. "That's also important. "Rooney is not a typical striker. Because of that it's then remarkable when you score so much. For a manager, he's a fantastic player."